I had a lot of faith in the Clark Law Firm; I was very comfortable. I let Clark Law Firm and Bill Peck do everything they needed to do to get my case settled. I didn’t even have to go to court. I didn’t have to go back and forth; just a few phone calls and visits to the office. I am happy with the settlement. No amount of money can replace certain things, but Bill and the Clark Law Firm did their best to make me whole again. [My experience with the Clark Law Firm] was very good. I was treated very respectfully, and they took my case seriously. I felt they wanted to get the best [result] for me. It was very positive – they felt like friends to me. They called me for any question they had, and I was able to call them multiple times for any silly question I would have. What I love about the Clark law firm is that they have multiple locations, and everyone is friendly. Instead of driving to Belmar, I was able to meet people at the Newark location which made it convenient for me. I would recommend the Clark Law Firm to any friends and family. Gerald Clark is not only an amazing attorney, he is also an honest, caring, and compassionate person. He represented my family and many of my friends from the Latino Community in cases involving cars and work related accidents and he always went above and beyond to help them, even learning their languages (He speaks Portuguese very well). He is very dedicated to his work and his cases, you couldn’t ask for a better attorney. I highly recommend him to my clients, friends and family. 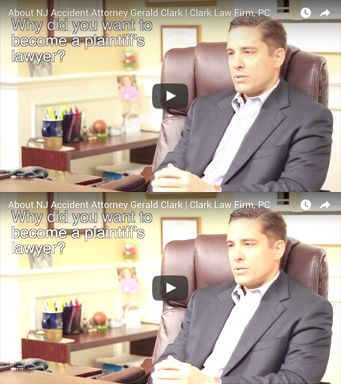 [My case was] very stressful – but the upside is when I needed a question answered or I was upset about something, The Clark Law Firm was always there when I called or emailed. We were treated really well. When I called or needed something, Tania the paralegal made sure I was OK and my questions were answered so I was satisfied. It was definitely a positive experience – all the meetings we had at the Newark office or on the phone, they were always there. In the end, the result of what they’ve been able to do for me has been phenomenal. We feel like my quality of life will improve, and we’re happy with our settlement. We pushed and I got what I wanted, and I feel they helped me accomplish that. I would absolutely recommend Jerry and the Clark Law Firm. We never felt we would need a lawyer but we knew that the Clark Law Firm had our back. I could trust them 100% and we would be satisfied with the outcome. – Tracy and Scott R.